RefrigiWear garments can be customized to your exact specifications. You must contact Customer Service at 800-645-3744 to request customization of your garment. Please allow two weeks for delivery. 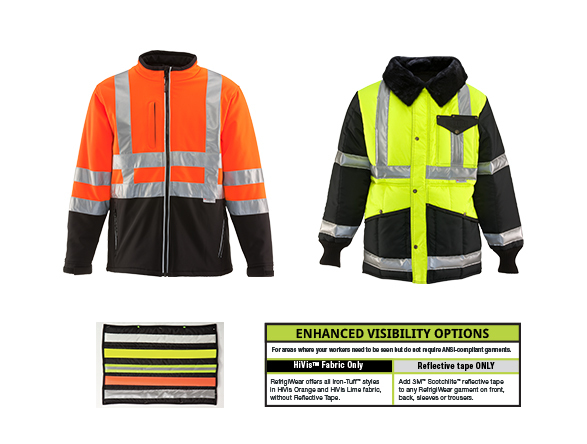 The American National Standard ANSI/ISEA 107-2010, High-Visibility Safety Apparel and Headwear, is an industry consensus standard that specifies requirements for apparel and headwear that is capable of visually signaling the user's presence. Many of our garments meet these standards, and we also offer apparel, gloves, headwear and boots with HiVis™ accents to further improve safety in the workplace. All custom garments are subject to a 30% upcharge.